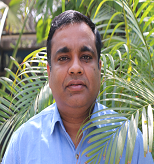 He has more than ten years of experience in industries like Manufacturing, Financial Services, Software and IT and have worked with reputed companies like FIITJEE Edusoft, Religare, Rosenthal India and Jindal ISPAT. He has worked as founding team member for start-ups in healthcare, pharmaceuticals and IT. He has also been a visiting faculty at IMT-Ghaziabad, IMI-Delhi and CIMP-Patna for courses in Marketing and Operation Management. 3. Mishra, V., Samuel, C., & Sharma, S. K. (2016, December). Visualization of perceived expensiveness of diabetes-Fuzzy MDS Approach. In Electrical, Computer and Electronics Engineering (UPCON), 2016 IEEE Uttar Pradesh Section International Conference on (pp. 67-71). IEEE. 4. Mishra, V., Rautela, A., Manjunath, B., Samuel, C., Sharma, S. K., & Mishra, A. (2016). Use of Visual Analytics and Durometer in Risk Reduction of Foot Problems in Diabetes. In CAD/CAM, Robotics and Factories of the Future (pp. 491-498). Springer, New Delhi. 5. Mishra, V., Samuel, C., & Sharma, S. K. (2015). Use of machine learning to predict the onset of diabetes. International Journal of Recent advances in Mechanical Engineering (IJMECH), 4(2).